Caracas (AFP) - Venezuela's opposition announced Monday a new collection center for desperately-needed supplies as it prepares to "send a message" to the military that's blocking humanitarian aid from entering the crisis-wracked country with a mass street protest. 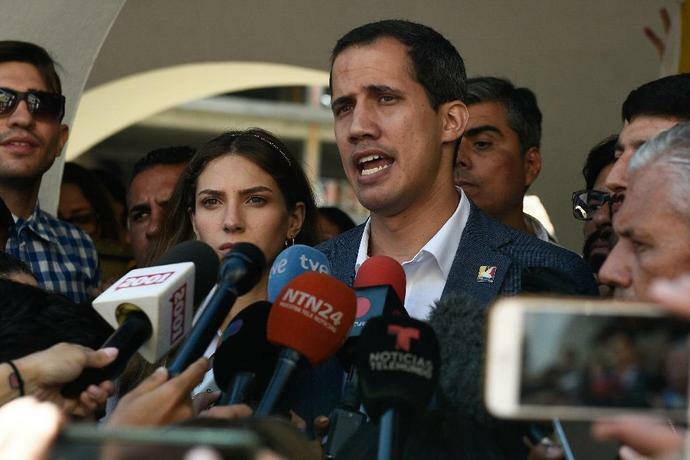 Opposition chief Juan Guaido, now recognized by 50 countries as Venezuela's interim president, will lead a rally on Tuesday as he steps up pressure on beleaguered President Nicolas Maduro and tries to force the military to back down and allow in the aid. Venezuela is in the midst of a disastrous economic crisis marked by hyperinflation, recession and shortages of basic necessities such as food and medicines. 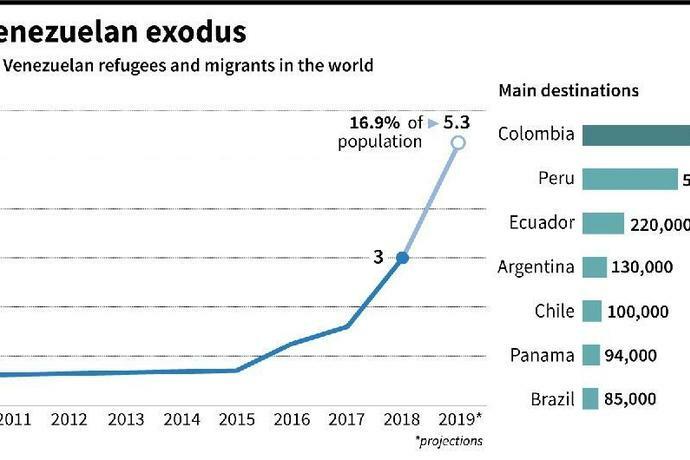 The UN says some 2.3 million people have fled the country since 2015. 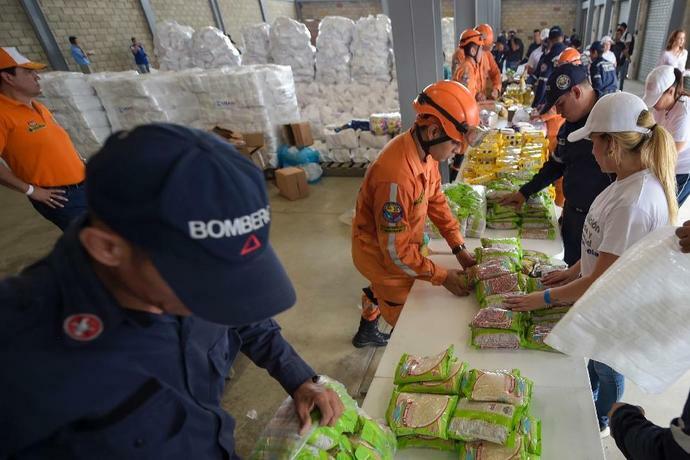 Guaido says 300,000 people risk death if the supplies donated by the United States and others, stockpiled at Venezuela's border with Colombia, are not brought in soon. He said that blocking the aid would constitute a "crime against humanity," but top military leaders still stand with leftist leader Maduro. Guaido says almost 100,000 Venezuelans have signed up as volunteers to help bring in the aid and distribute it to those most in need. "This a crime against humanity, men of the armed forces," Guaido said Sunday. He has offered amnesty for any members of the armed forces who disavow Maduro, in a bid to break the president's backbone of power. Guaid will press the Organization of American States to provide support to hold new presidential elections, his representative to the body Gustavo Tarre said ahead of Friday's special meeting at the OAS on the situation in Venezuela. "The observation of the OAS is a guarantee, it has a great weight for the moral prestige of the organization and it has the technical capacity to help us set up a transparent process," Tarre told reporters after meeting in Washington with Francisco Guerrero, who leads the OAS Secretariat for Strengthening Democracy. However, he stressed that in order to be impartial, holding elections will take time. "We want everything to go as quickly as possible, but holding elections in a month is impossible. We do not currently have any electoral mechanism that works because everything has been tarnished by fraud. In Venezuela, voters vote but do not choose, and we will change that." Speaking to AFP last week, Guaido refused to rule out eliciting foreign intervention. (Bloomberg) -- Chevron Corp.'s largest producing joint venture with Venezuela is still struggling to resume normal operations after rolling blackouts temporarily knocked oil output to zero. On Wednesday, the opposition-controlled National Assembly's finance commission approved a measure to vote next Tuesday on the disbursement to holders of state oil producer PDVSA's notes due in 2020. Technically, the PDVSA board controlled by President Nicolas Maduro has the power to pay as well. It forked over nearly $1 billion late last year to stay current on the bond, even as Venezuela missed more than $10 billion in payments on other securities.